A crash along Interstate 20 and Bonnie View Road in south Dallas, July 10, 2018. A jackknifed big-rig caused a traffic jam in South Dallas Tuesday afternoon. 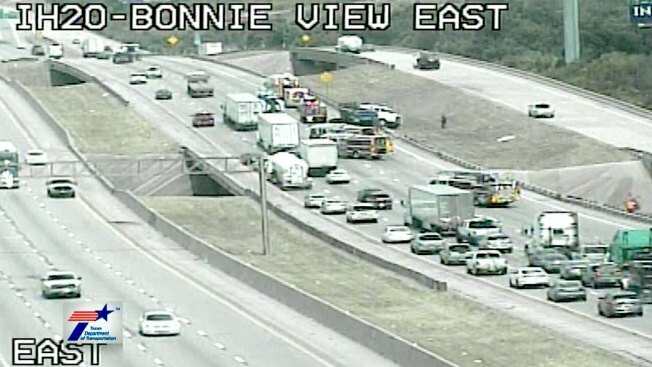 At about 2:30 p.m., an 18-wheeler crashed on eastbound Interstate 20, just east of Bonnie View Road, spilling approximately 60 gallons of diesel fuel onto the road. Two of the four eastbound lanes on I-20 were blocked while crews cleaned up the area. Traffic was backed up to the west beyond Interstate 35E, a distance of approximately 4.5 miles. There are no reports of any injuries at this time, according to Dallas police.